Start here if you are new to our site, or new to EFT. Comprehensive training, complete with easy to follow videos, will take you from beginner to high level. Written by EFT'ers worldwide ... how-to's ... tips & hints ... creativity. Expand your EFT skills with our full suite of content rich video sessions and instructions. Personally conducted by Gary Craig. Quality Webinars. No need to travel or spend money. 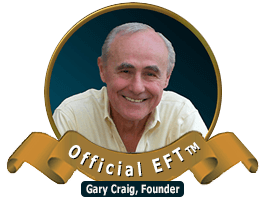 Certified Gold Standard EFT Practitioners will help you resolve your issues.